A Word or Two: Grant turns 2! Somehow the time just flew by and Grant is now two years old! 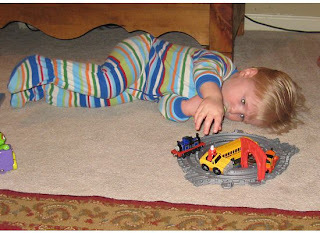 He is very into cars, trucks, and trains. It is fun to listen to him make all the sounds and point to them as we drive or if he hears a siren he chimes in "whoo whoo". I decided to try again to make a birthday cake this time with the train theme. I thought the end result turned out pretty good. Grant got several new Thomas trains to add to a new track. This is the life for Grant! Happy Birthday, sweet boy! 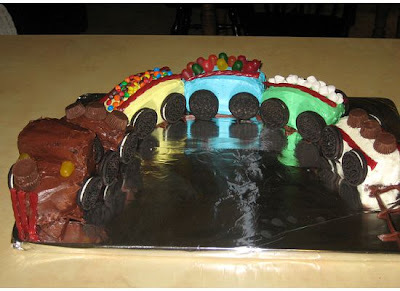 I love the train cake! Too cute, Sara! 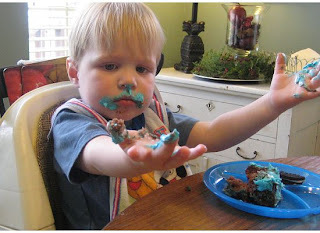 I, too, have a hard time believing Grant is already two. I enjoyed the latest posts on both kiddos. Both seem to be doing so well! :) Happy Belated Birthday, Grant!! 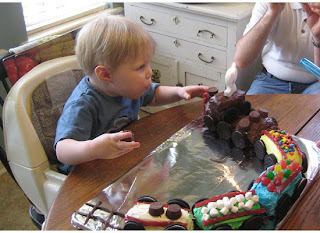 I love the train cake! Great job! We just celebrated Madeline's second birthday too. I am loving two so far. A little more attitude, but a lot more fun now that she is a "real person" and not just a baby. :) Hope you guys are doing well. Wow! Sara's got cake skills. That looks awesome! And he's such a sweet little man. What an exciting day. Glad Grant had a super fun birthday! That is the cutest cake ever! Very impressive. I guess we can't call him "Baby Grant" anymore... Boo hoo. 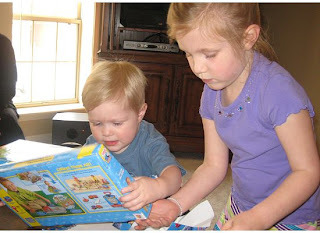 I am a stay-at-home mom for our 7-year-old daughter, Laura, and our baby boy, Grant, who is 3. Ethereal theme. Theme images by Storman. Powered by Blogger.